This is really a story about how to collect feedback from your users. Three simple lessons that can be applied to any industry, in this case courtesy of our friends over at TSA. Let’s put this in terms that even an intelligence-challenged male model can understand. Does you even know how to use a QR code? If I – someone who’s been in mobile software development for nearly a decade – don’t readily know how to scan a QR code then do you think any meaningful percentage of the two dozen people standing around me in the airport do? Hollywood can again demonstrate this one – how many of the people George Clooney is trying to avoid how to use a QR code? Myspace would be better option. 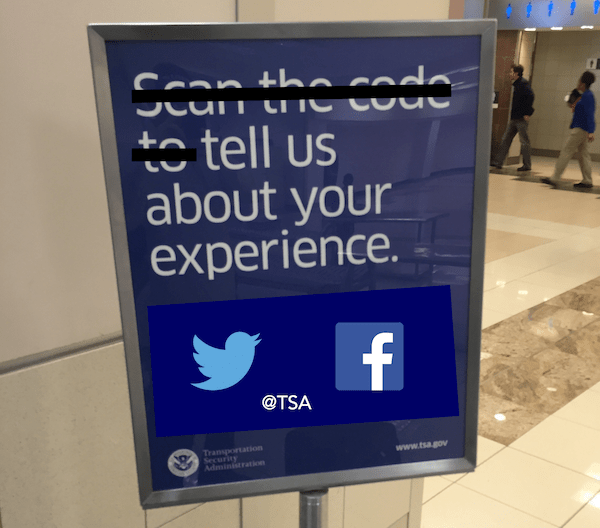 Instead, what the TSA is saying is that they don’t actually care about our feedback. Why doesn’t the sign look like this?!? This incredibly crude hack of a sign is better than the one you’ll see in the airport this afternoon. Lesson one is to make it incredibly easy for your users to give you feedback. Remember, you’re asking for their time and help. The harder you make it or the more time consuming it is, your chances of getting a response plummet. When soliciting feedback from your users, be prepared to take action on that feedback. Seeing these same issues over and over tells the user their feedback won’t go anywhere. Lesson two is to do something, to take action on the feedback you get. This may seem a bit obvious but it’s an important reminder that if you don’t your users will quickly abandon giving you constructive feedback. Once you have decided to take action on the feedback you have received (lesson two), lesson three is to communicate what you are going to do and why. No, you don’t have to implement every piece of feedback you receive. 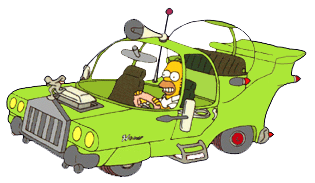 Actually you shouldn’t – that would be an issue of its own and is how you end up with something like the The Homer Car. Instead you need to communicate (1) what you’re going to do, (2) what you’re not going to do, and (3) why. There may be completely legitimate reasons the TSA hasn’t “fixed” the bulleted list of issues I highlighted. They may not be problems, and instead by design. However, if you don’t communicate to your users why something is a particular way then they will continue to assume it’s a problem. And problems in the eyes of your users create a negative user experience. Another way to create a negative user experience is to apply your actions inconsistently. …some airports I have to take my shoes off; others let me keep them on. …sometimes the screening agent cares if I take out my gels & liquids, sometimes she doesn’t. …sometimes I go through the boring rectangular scanner, other times the agent sends me through the spaceship portal-looking scanner. Not only do you need to communicate back to your users after they’ve given you feedback, but your message also needs to be consistent. Inconsistent user experiences create confusion for the user about what kind of feedback to give. A consistent experience for your user will lead to consistent feedback from those users, regardless of whether it’s positive or negative. Apply your changes consistently and explain why you’re making the changes you are.